In most head and neck sites in the human body, the most frequently encountered malignant disease is squamous cell cancer. Squamous cells are the thin, flat cells that line the inside of the oropharynx. Two of the major risk factors contributing to the disease is cigarette smoking and excessive alcohol consumption. The oropharynx is the middle part of the pharynx (throat) behind the mouth, and includes the back one-third of the tongue, the soft palate, the side and back walls of the throat, and the tonsils. The pharynx is a hollow tube about 5 inches long that starts behind the nose and ends at the top of the trachea (windpipe) and esophagus (the tube that goes from the throat to the stomach). Air and food pass through the pharynx on the way to the trachea or the esophagus. Over the past few decades, doctors have noted a surprising trend in cancer of the tonsils and base of the tongue. Though oral cancer previously appeared predominantly in elderly patients with a history of tobacco and alcohol use, it's increasing in younger patients: 30- to 50-year-old nonsmokers with the human papillomavirus (HPV). Fortunately, the newer form of cancer tends to be less aggressive, and the latest approach to treating the tumors can avoid the debilitating consequences of open neck surgery or extensive radiation. Robotic surgery conducted through patients' mouths provides excellent results in removing squamous cell carcinoma at the back of the throat, especially in patients with HPV, a Mayo Clinic study published in the March issue of Mayo Clinic Proceedings found. 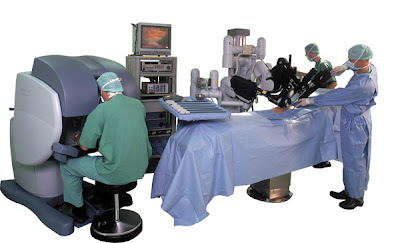 Robotic surgery is a technique in which a surgeon performs surgery using a computer that remotely controls very small instruments attached to a robot. 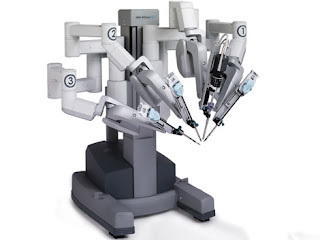 The robot ensures more precise incisions since it reduces the surgeon's movements, which reduces some of the hand tremors and unnecessary movements. Also, robotic instruments can access hard-to-reach areas of your body more easily through smaller surgical cuts compared to traditional open and laparoscopic surgery. "We were surprised that the cancer cure results were even better than the traditional treatments that we have been doing, but that is probably almost as much of a matter that these cancers are HPV-mediated for the most part, and they respond much better to treatment," says author Eric Moore, M.D., a head and neck surgeon at Mayo Clinic in Rochester. "Importantly, the treatment preserved patients' ability to swallow and their speech performance was excellent." Dr. Moore and his team followed 66 patients with oropharyngeal cancer who underwent transoral robotic surgery with the da Vinci robotic surgical system. Every few months, the patients had imaging studies, scans and exams to determine if cancer was recurring. After two years, researchers found that patients' survival rate was greater than 92 percent, as good as rates for some other surgical and nonsurgical treatments for oropharyngeal cancer. Because traditional surgery techniques to remove throat tumors can be traumatic, requiring cutting and reconstructing the jawbone, neck and tongue, researchers were also interested in patients' healing after robotic surgery. "We found that with transoral robotic surgery 96 percent of patients could swallow a normal diet within three weeks of treatment," Dr. Moore says. Less than 4 percent required a gastrostomy tube, which enables food to bypass the throat. The study provides preliminary data showing the robotic surgery is a viable treatment option, Dr. Moore says. Continuing research involving multiple medical centers will investigate transoral robotic surgery in a larger population of patients with oropharyngeal cancer.